The Grand History of the Realms is a supplement to the 3.5 edition of the Dungeons & Dragons role-playing game. The Grand History of the Realms is an accessory for the Forgotten Realms which presents a definitive in-game history of the setting from the dawn of recorded history through the ancient days of Netheril and the Fallen Kingdoms, to the Time of Troubles and the uphevals of the present time in the setting. The text is accompanied by anecdotes, diary entries, letters, and historical texts created by famous personalities of Faerun, and an extensive and comprehensive timeline including a sneak peek into upcoming events. 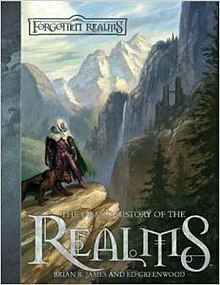 The Grand History of the Realms was written by Brian R. James, Ed Greenwood, George Krashos, Eric L. Boyd and Thomas Costa, and published in September 2007. Cover art was by Todd Lockwood, with interior art by Kyle Anderson, Glen Angus, Steven Belledin, Matt Cavotta, Rafael Garres Cervantes, Ed Cox, Daarken, Wayne England, Jason A. Engle, Emily Fiegenschuh, Carl Frank, Ralph Horsley, Andrew Hou, David Hudnut, Jeremy Jarvis, Dana Knutson, Ginger Kubic, Stephanie Law, Howard Lyon, David Martin, Dennis Crabapple McClain, William O'Connor, Lucio Parrillo, Jim Pavelec, Michael Phillippi, Steve Prescott, Wayne Reynolds, Ron Spencer, Stephen Tappin, Joel Thomas, Derek Thompson, Franz Vohwinkel, Eva Widermann, and Sam Wood.